THE SKINNY: L'oreal Youth Code BB Cream Illuminator is an affordable BB cream that feels similar to a higher-end product that costs twice as much. Plus, it has SPF 15. Use this cream in place of (or over, if you prefer) your usual moisturizer. It's designed to even out your skin tone, add a dewy glow, moisturize and protect your face from the elements. The cream is lightweight and glides on effortlessly. I'm using the "light," and it blends flawlessly with my fair skin. The result is fabulous. I've only needed a dusting of powder to complete the look. It also fights oil in my T-zone, which makes me really happy. The coverage lasts all day and it hasn't caused me any breakouts or skin problems. KEEP OR TOSS: Keep. I've been using this BB cream daily and love it. 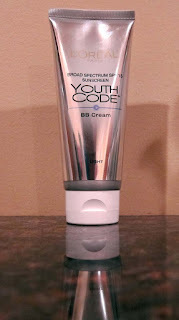 CHECK IT OUT: Youth Code only comes in two shades: light and medium.